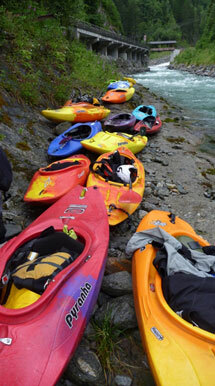 This is a guide to some of the places we go river paddling. We always like to go to new places and are willing to try out new accomodation, so feel free to organise something different from some of the suggestions below. The following is just a guide, you do not have to adhere to it! Shepperton, Non-tidal sections of the River Thames, the Wandle, the Mole and the Medway are some of the paddle that we do as a day trip. These are suitable for paddlers with little paddling experience, so long as there is sufficient cover from more experienced paddlers. When there is rain some paddlers in the club head to some of the Thames weirs such as Shepperton or Hurley. These are popular playboating venues. Most of the artificial white water courses can be visited in a day from London. See below for details. Dartmoor is a favourite location for weekend trips. The river Dart has three sections: the Lower, the Loop and the Upper. Each section suits a different category of paddler. The Lower is usually suitable for novice paddlers as a first time on white water. The Loop is one of the most paddled sections of white water in the South West. It is Grade 2-3 with great scenery. It is a great place for Intermediate and Advanced paddlers. The Upper Dart is for advanced Intermediate or Advanced paddlers. It is continuous Grade 3-4. The water levels on the Dart can rise rapidly in a short period of time and the grade of each section rises with the water level. Other rivers in the area are the Walkham, Erme and Tavy. There is good walking and mountain biking on Dartmoor. If the rivers are low, you can check the surf reports and head to Bantham on the South coast or some of the beaches on the North coast in the Woolacombe-Saunton area. The River Dart Country Park is a convenient place to stay. It has a bunkhouse with dormitories, a bar and cafe and a canoe shop and ample parking space. It is conveniently at the get out of the Loop section or the get in for the Lower section. There are also some very comfortable self catering called Blackadon Barn Cottages. The Rivers Wye and Usk provide some good novice-intermediate white water. There are several sections on both rivers that are worth considering. The Tawe is for more advanced paddlers. Llangorse Activity Centre is a good place to stay. It has a huge climbing wall area for those interested in an alternative activity. If the rivers are low then a trip the artificial white water course at Cardiff, (CIWW), is well worth a visit. Symonds Yat is actually in England but is close by in the Forest of Dean. It is a very easy introduction to white water. Flat water paddles can on the Wye above and below Symonds Yat. The bunkhouse at the Jovial Colliers Arms is a handy place to stay for a Symonds Yat trip. The food is basic but the bar stays open late! The River Tryweryn is a favourite destination for our white water paddlers. It provides reliable white water, when there are releases. The upper section is grade 3+ and the lower is an easier paddle, (Grade 2-3 with one Grade 4 which can easily be portaged). We usually stay at the Tyisaf campsite which is on a farm, is fairly basic and situated a few miles out of Bala. Pubs and places to eat can be found in Bala, which is a short drive away. Another favourite destination is Dolgellau on the border of Snowdonia National Park. It is a short drive from the Tryweryn and other rivers in North Wales, (Mawwdach, Ogwen etc). It is perfectly situated for mountain biking or walking in Coed-y-Brenin. There are several campsites nearby or log cabins can be found in Trawsfynydd. There are now quite a few artificial white water courses in the U.K which provide year round access to white water paddling. Lee Valley White Water Centre, (LVWWC), has recently open prior to the Olympic games in 2012. It has two courses: Olympic and Legacy. Olympic is Grade 4 and Legacy Grade 2-3. Both are great places to practice white water paddling. It is about a 1 hour 15 minute drivefrom Battersea area. The Nene White Water Centre is in Northampton and is a suitable place for introducing white water paddling to novice or intermediate paddlers. It is about 2.5 hours drive from Battersea area and is open on Sundays. You need to check their website to see if it is going to be open when you plan to go. Cardiff International White Water Centre, (CIWW), is only 3 hours drive from London in Cardiff. It is Grade 3 and suitable for intermediate or advanced paddlers. This can be done in a day if you are keen. It is also a great place to stop at if in the South Wales area, (e.g. Symonds Yat, Usk trips or surf trips to the Gower). Holme Pierrepoint is the oldest artificial white water course in the U.K. The course is Grade 3 and so is suitable for intermediate and advanced paddlers. The water quality can be an issue. The course has recently been revamped. It is possible to do this as a day trip from London, (about 3 hours drive each way), although some may prefer to stay overnight on the Saturday at the campsite nearby. The Austrian Alps is a fantastic place for intermediate and advanced paddlers to run big volume Grade 3-4+ in the summer! The club go most years at the beginning of July for our annual Alps trip. We usually stay at the campsite at Prutz which is conveniently situated at the end of the Tosens section of the river Inn. We paddle sections of the River Inn, the Sanna, Lower Oetz, Loisach etc. These rivers that we paddle are suitable for confident intermediate paddlers with a reliable roll. There is also great hiking, biking and climbing in the area. Some years we have skied on the Kaunertal glacier in the morning. We frequent the local restaurants and bars which are a short walk from the campsite. We also have BBQs on the campsite. The French Alps is another great place to paddle white water during the summer months. About one year in every four the club goes to the French Alps instead, or as well as, the Austrian Alps. We stay at a campsite just outside of Briancon. The rivers tend to be more technical with less volume than the Austrian ones. We paddle on sections of the Durance, Guil, Guisanne, Onde, Gyronde etc. There is also good hiking and biking in the area. The campsite has a swimming pool and volleyball court. In the last couple of years some of the club have been to the Wet West Paddlefest in Scotland. The Lake District and Scotland are great places for white water paddling. Suggest somewhere new and people will show interest! The club has ventured as far afield as New Zealand!